Why do Hulu and other streaming video services show the same ads over and over? Because there's little incentive not to. About a month ago, I noticed a discomforting change in one of my favorite streaming video apps. Pluto.TV, an app that cleverly strings online video into round-the-clock streaming channels, had started including ads in its programming. But the problem wasn’t so much with the notion of commercial breaks as with the advertisements themselves: Unlike a traditional TV channel, Pluto kept showing the same ads over and over again, to the point that I got sick of seeing them. Pluto isn’t alone in its repetitive ad problem. For years, I’ve noticed similar patterns in other ad-supported streaming services, such as Hulu and Crackle, and never really understood why. In theory, the Internet’s massive inventory and personalization powers should make video advertising much more tolerable than traditional TV. Instead, online video ads are often much worse. Here’s the kicker: After asking a few industry experts about repetitive ads, I’ve concluded that there’s not even much incentive to fix the problem. Repetitive ads aren’t as big of a problem for traditional TV because it’s a much more manageable system. TV networks work with a single linear feed, which means they can program every ad ahead of time. Moreover, those networks have huge sales teams and scads of potential advertising partners, and every year they form a big huddle to figure out where those ads will go. 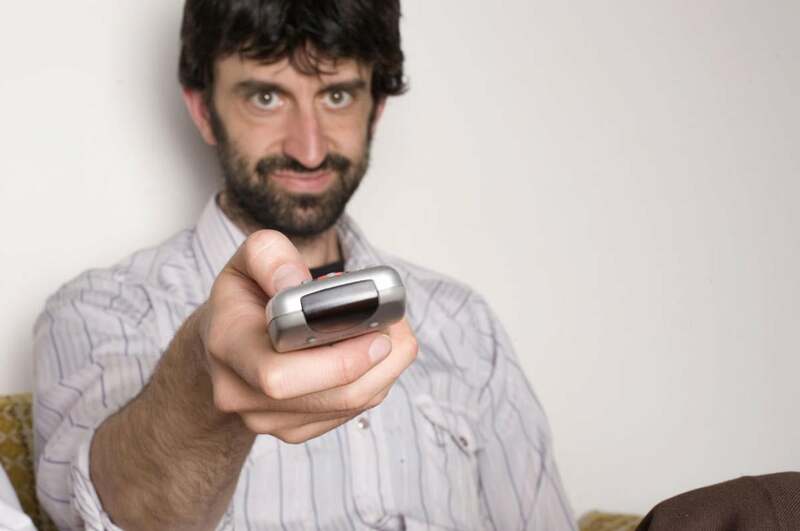 That human touch goes a long way toward preventing a single brand from monopolizing ad slots, said Colin Petrie-Norris, CEO of streaming video service Xumo. “If an ad buyer was to actually say, ‘Hey, I want to run every ad break during a football game,’ somewhere along the way, a human would go, ‘Why the hell would you want to do that?’ and probably charge a fortune for it,” Petrie-Norris said. Online video is more complicated. Streaming services usually aren’t dealing with a single scheduled programming feed, but rather a countless number of on-demand streams. The challenge, then, is to fit advertisements into commercial breaks as they become available. How many times have you seen this ad on Hulu? 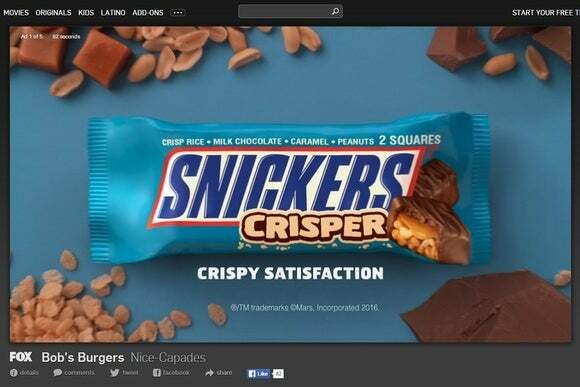 How many more times will you see it before you decide you don't like Snickers after all? If Hulu had 10 million viewers watching 10 million episodes every month, repetition wouldn’t be a problem. But what if only 500,000 sets of eyeballs are available in that time span? Now each of those viewers has to watch the same ad 20 times for Hulu to make good on its commitment. While advertisers and streaming services can specify how frequently a certain ad gets shown, Green said these types of stipulations can come at a cost, such as a higher payout per impression. The result is that neither party is overly strict about oversaturation, and the user experience takes a back seat. Direct sales may be the most lucrative form of video advertising, but they aren’t the only option. When ad slots aren’t sold directly, streaming services typically turn to ad exchanges to fill the gaps. With an ad exchange, advertisers specify which demographics they want to reach and how much they’re willing to pay, and streaming services sell their open ad slots in real time to the highest bidder. It’s sort of like a stock exchange for ads. The feeling of repetition can run rampant under this system, because it’s not really optimized for TV, Petrie-Norris said. Instead, ad servers tend to be built for pre-roll ads on desktop websites, where you might not mind seeing the same ad in consecutive (but occasional) YouTube clips. If you’re sitting down in front of the television for an hour, those same four or five ads in a row become a lot less tolerable. Frustratingly enough, these ad servers do have the ability to put time limits on how often an ad appears. But right now, most ad agencies don’t bother to put these controls in place. “Most people are just looking to spend the money, hit their objectives, and be done. They’re not looking to slow down their delivery methods,” Petrie-Norris said. Likewise, streaming services are trying to maximize the amount of money they make from an open ad slot. The bottom line is if an advertiser is bidding highly for impressions, those ads are going to get shown a lot. The underlying issue here is that repetitive ads, while obnoxious to the user, may not be such a bad thing for advertisers and streaming services. Repetition, after all, is one way for brands to make sure they stick in your minds, and there’s a general notion among advertisers that it takes three or four times for this to happen. While this has always been the case with advertising, the nature of online video removes the incentives for doing anything about it. “Sometimes, for an advertiser that just wants to be remembered, saturating you with five ads in a row could be a viable strategy for them,” Petrie-Norris said. Despite this grim outlook, it’s possible to imagine a few sources of relief. For one thing, streaming video will keep getting more popular, bringing in more users to share the ad load. And as more advertisers show interest in online video, viewers could get exposed to a wider variety of ads overall. But the other impact on repetitive ads may be less direct: With services like Netflix, HBO Now, and Amazon Prime, online video is becoming defined by a total absence of advertising. Hulu and YouTube have both responded in recent months with their own ad-free versions, and CBS has been considering something similar for its All Access service. That’s not to say ad-supported services are going away, but I’d wager that people will become a lot less receptive to getting clubbed with the same ads for hours on end. Services that don’t bother to make commercial breaks tolerable—or, dare I say, enjoyable—might ultimately find that they have no impressions left to give.